Surprise! After a year long hiatus we have started back up with a farm share! That's right, folks. 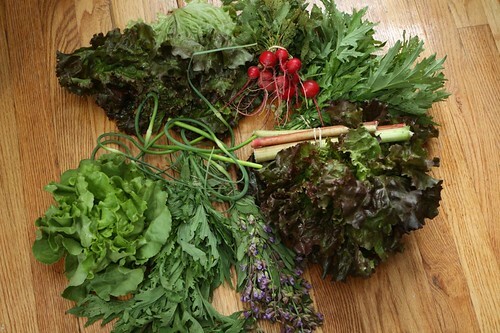 This year's farm share is brought to you by Stoneledge Farm in Leeds, New York which is about two hours from us. The first week's haul, predictably, consisted of mostly lettuce but it was great to be back in the game! This week we got a bunch of rhubarb, a bunch of radishes, red sail lettuce, buttercrunch lettuce, mizuna, suehlihung mustard greens, garlic scapes, and flowering sage. 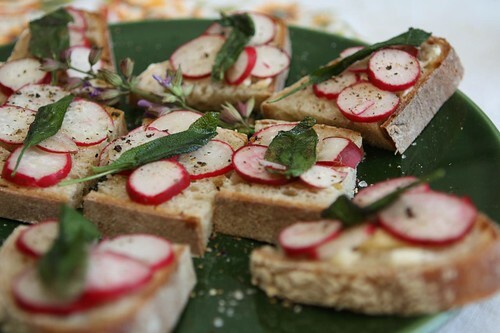 I started off by slicing up the radishes, and serving them over some slices of fresh bread with butter, salt, and pepper. I also fried up some of the sage leaves for the top. Usually I'd go with a raw herb but the fried sage worked out quite nicely. 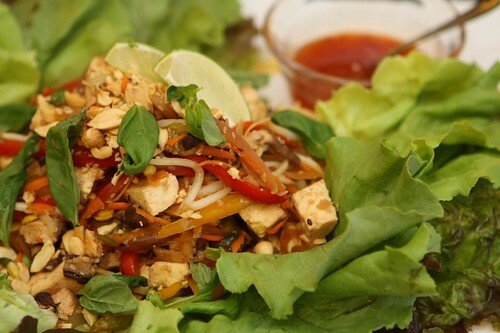 With so much lettuce available I opted to make these lettuce wraps. I toasted some of the garlic scapes and ginger in sesame oil then tossed in some sesame seeds, red onion, red and yellow peppers, jalapeno, celery, carrot, bean sprouts, and tofu. I used a little soy sauce, rice wine vinegar, lime juice, and mirin. For the lettuce I used some of the buttercrunch and the red sail lettuce. 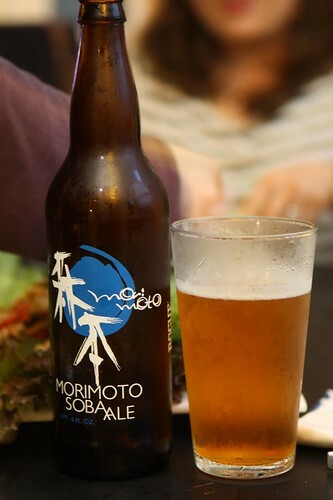 For beer I found this soba ale from Iron Chef Morimoto and Rogue Ales. I thought this might be a good accompaniment since it was made from soba. This beer was stranger than I would have imagined and had a wealth of information on the back. It listed how the beer performed on a number of scales: 12º PLATO, 30 IBU, 75 AA, 14º Lovibond. So, clearly, most of those are made up. Also it listed the ingredients that the beer was made from including "free range coastal waters" which sounds like a bunch of made up crap to me. Also listed was the ingredient "Harrington Metcalf" which sounds like a preppie trust fund baby who calls everyone "Lovie." For dessert Jen made two crisps: one was a peach crisp made in the traditional style. 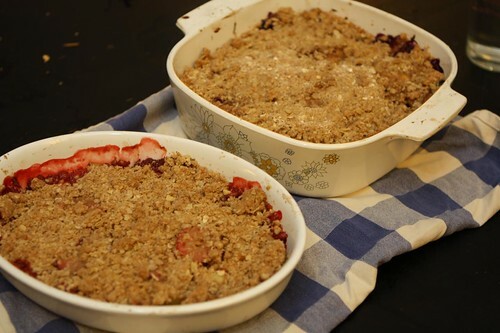 The other was a strawberry rhubarb crisp which was vegan. This served two purposes. Firstly it satisfied Lisa's vegan requirement. Secondly, it served Lauren's somewhat stranger requirement than now orange-yellow fruit are present. Labels: beer, Dessert, How'd we use it?, Iron Chef, What'd we get?